We wish you an abundance of love, great health and joy! I am always amazed at what I see on American television! The cartoon above pretty much says it all. "Stay off task and keep watching TBS"
"America runs on Dunkin Donuts"
Those are just 2 of the very telling slogans that I have heard on tv in the last 5 minutes!!! ... Interestingly enough I turned on the tv just now to get some content for this article and those were the first two commercials I saw. Hmmmm after only 5 minutes I saw exactly the kind of programming I wanted to write this article about. Makes me wonder about how many of these types (and worse) messages would enter my brain if I watched tv for 1 hour, 2 hours, 5 hours rather than just 5 minutes!! On the surface those slogans above may seem harmless but I really don't feel they are. Our brains take in millions of bits of audio and visual information every moment. Not all of that information gets processed into our conscious mind BUT it is all in there and our subconscious mind (the part that really runs the show) listens to all of it. Words, jingles and visual images are VERY powerful! The people that create these ads know that. They know that if they pair a message with beautiful images, a catchy tune, a well liked star and/or some humor there is a very high probability of that message becoming embedded and ingrained into the viewers' subconscious. And this increases exponentially if the commercial is shown several times during the course of a program or a viewing session. Having messages like the above (and so many others) embedded into our subconscious means that there is a likelihood that these will affect our thought processes and decision making. They are conditioning us to act and think a certain way without us even realizing it. "Stay off task and keep watching TBS" - watching mindless tv keeps you away from your life purpose, keeps you unmotivated and keeps you distracted from what is truly important in life. This slogan encourages you to keep doing this and also gives the message that it is okay and that you deserve to stay distracted, that you deserve a break from living a meaningful life. Nothing wrong with taking a break and having a laugh - that is actually healthy BUT to "stay off task" is not the goal!! "America runs on Dunkin Donuts" - delivers the message that without these types of junk foods America could not survive and that, it is not only okay, but necessary, to consume donuts. Perfectly designed commercials to make these companies money and to create loyal followers but while it does that it also creates much unhealth in the thinking and choices of the viewers. I haven't even touched upon all those commercials that pharmaceutical companies put out for the thousands of drugs that they create and push. They use the exact same method of pairing their message (use our drug) with nice music and beautiful images/beatiful healthy people. They embed the message that it is okay, helpful and necessary for you to take their drug in order to be your best. They get people to buy their message even while conveying a long list of horrendous side effects. That is how powerful this type of advertising is; no matter how far from logic, common sense and natural instict these messages are they can still be embedded into your subconscious and effect the decisions you make. These commercials exist for the sole purpose of making the companies behind them money - that is it!! They do not exist to make your life better, to help you reach your goals or to inspire you to be healthy ... that is just what they want you to think and believe. There are countries in Europe that have banned this type of advertising towards children which I think is a great step, one I hope will be followed by more steps in this direction and by more countries. 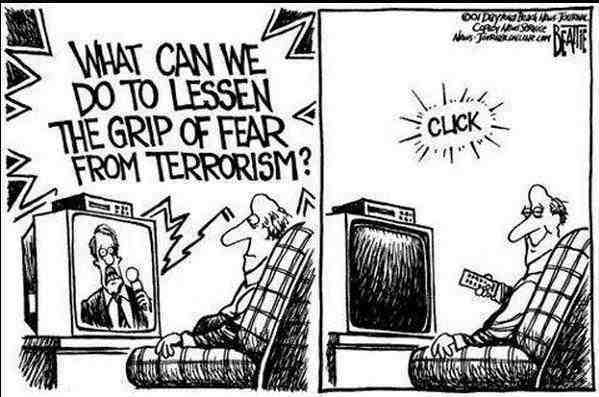 Get rid of your tv. This may seem extreme but it is always an option. I lived for 10 years without a tv and I didn't miss it a bit. My life was a lot more productive without a tv. Get rid of all the channels. This way you avoid channel surfing and being exposed to commercials. Use your tv to watch programs and movies that you choose. Tape your favourite programs. And then watch them without the commercials. Invest in one of those devices that will tape your shows for you while cutting out the adverts. Monitor closely what your children watch. Companies are ruthless in their advertising towards children and children are very susceptible. Do a TV detox. Have a weekend, week, month, year, even a day with no tv. Give your subconscious a break from the bombardment. Once you do there will be space for your creative mind and subconscious intuition to work its magic and truly help you to be exactly the person you were meant to be. Join others to fight against this. Join others who are lobbying against this type of advertising, you may be just the voice to help get these messages turned around. Make healthy choices if you choose to watch TV! 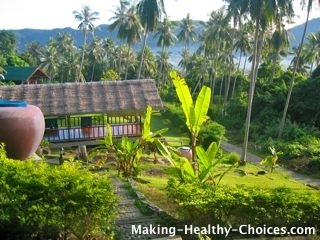 For four years I lived in Thailand and worked as the Executive Health Advisor at one of the world's most famous detox retreats. While there I helped thousands of people through cleansing fasts and with healthy information to take home with them. Thailand's tropical environment and friendly atmosphere is idyllic for retreating, cleansing, detoxing and all around wellbeing. I warmly invite you to join me as I travel back to Thailand. I will be leading a week long retreat together with Earl Talbot. Earl has been hosting these 'Finding the Guru Within' retreats for several years and I am happy to be assisting him once again. These retreats are amazing and life changing for many. The retreat will be held from October 7-15, 2013. This is a gorgeous sweet pudding that is raw and vegan. It is creamy and delicious and also very healthy. Chia seeds are a powerhouse of nutrition!! With Love, whisk all ingredients together in a bowl except chia seeds. Once you have whisked everything into a blended liquid then stir in chia seeds. Cover and let sit for 30 minutes or longer (overnight is best). Enjoy your sweet healthy treat! FOR MORE INFORMATION ON THE NUTRITION OF CHIA SEEDS AND OTHER GREAT CHIA RECIPES, click here.